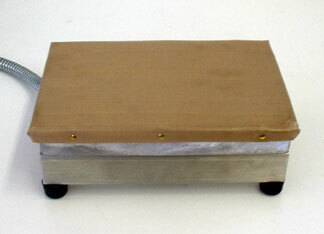 The Kwik Portable Hot Plate by Heat Seal Equipment is used for heat sealing film wraps. Perfect for sealing food, sandwiches, and other products that are film wrapped. Can be used on a table top or counter. They come in two models: TT69 (6" x 9", 500W heat element) and TT912 (9" x 12", 1000W heat element). Each unit has an adjustable thermostat temperature control with a range of 100-550F and a non-stick teflon cover. Uses standard 110V electrical. Kwik Portable Hot Plate Model TT69 by Heat Seal, 6" x 9" with adjustable thermostat temperature control and non-stick teflon cover. NOTE: Hot Plates usually ship in 1-2 days, FOB: Culver City, CA.